Join us for our annual Yuri’s night social at Frenchie’s! Please RSVP on the event page or on the Eventbrite page. 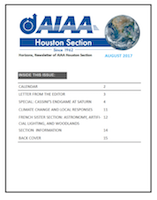 The AIAA Houston Section will have a dinner event with Dan Adamo next Thursday, January 31, 6pm, at Anita Gale’s residence! See the flyer (PDF) for more details. …note the JSC Federal Credit Union info for “furlough loan” assistance. JSC Federal Credit Union is dedicated to helping our members during periods of financial difficulty. Starting January 3rd, the Credit Union be offering financial relief to members who will be affected by the Government Shutdown. JSC FCU will offer a no fee Skip A Payment on Personal, Line of Credit and Vehicle Loans (excludes mortgages). We will continue to monitor the situation as it changes; please check back regularly for updates. Call 281.488.7070 or visit a branch location for more details. *Maximum number of loans granted is 3 with an aggregate limit of $18,000. Please contact a representative for more details. Let’s talk about engineering, current aerospace, think tank Ideas and processes over coffee and pasties. When: Saturday Mornings 8:30-9:30 AM. AIAA will get your coffee. Each Saturday we will have a trivia questions for you to check your space knowledge. All guesses go into a drawing box, the first correct guess receives a Starbucks gift card. Share this flyer (PDF) with your colleagues!